Numskull Designs is a company that deals in officially licensed video game and pop culture merchandise. It covers Monster Hunter, Fallout, Destiny, and now it has added Mortal Kombat to the list. 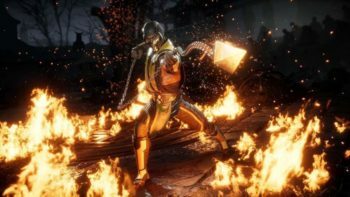 However, instead of offering swag based on the upcoming Mortal Kombat game, Mortal Kombat 11, Numskull Designs’ new offerings harken back to the series’ roots. Currently, Numskull Designs offers three shirts, one hat, a keychain, a mug, and a candle, all inspired by the original Mortal Kombat arcade game. Yes, you read that correctly: a candle. Each of Numskull Designs’ shirts features bright and colorful graphics on a black background. One displays a bloody heart that was freshly ripped out of a ribcage (probably Kano’s handiwork); another shows Raiden in his electrifying classic attire, and the final shirt includes the classic “Choose Your Fighter” select screen. The hat, keychain, and mug, meanwhile, only feature the iconic Mortal Kombat logo in all its silhouette dragon glory, but that’s hardly a complaint. Moreover, the mug is a heat changing cup, so anyone who wants to see the logo needs to pour some hot coffee or tea first. Just a warning: do not put the mug in the dishwasher. However, Numskull Designs’ spotlight Mortal Kombat product is probably the candle. Not only does it come in a metallic tin that features the fighter select screen, but according to the product’s page, the candle also includes the “immersive scent of blood, sweat, & tears.” I am not making that up. This “Blood, Sweat, & Tears” candle is apparently the latest in Numskull’s long line of themed and scented candle products. The company has also produced a Rick and Morty-themed candle that smells of Plumbus, a Spyro the Dragon candle with the scent of burnt sheep, and even a Resident Evil 2 candle that smells like a rotting zombie. Again, not making this up. You can check out Numskull Designs’ entire Mortal Kombat lineup on the official site.